93rd Monthly Protest Action Free All The Cuban 5 Now! Release Antonio, Fernando, Ramón & Gerardo From U.S. Prisons Now! Grant Visa to Adriana Perez! 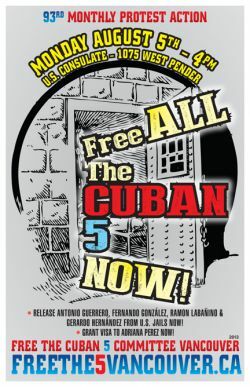 FREE ALL THE 5 CUBAN HEROES NOW! RELEASE ANTONIO, FERNANDO, RAMÓN & GERARDO FROM U.S. PRISONS NOW! GRANT A VISA TO ADRIANA PEREZ NOW! WHO ARE THE 5 CUBAN HEROES? in Cuba, including one resident of Canada, Fabio di Celmo, in 1997. LUCHA POR LOS DERECHOS HUMANOS! !LIBEREN A TODOS LOS CINCO CUBANOS AHORA! ¡LIBEREN A TODOS LOS CINCO HÉROES AHORA! ¡OTÓRGUENLE INMEDIATAMENTE VISA A ADRIANA PÉREZ! ¿QUIÉNES SON LOS CINCO HÉROES CUBANOS? estos cinco hombres lograron impedir más muertes en Cuba.